The Keewatin-Patricia District School Board’s Four Directions Graduation Coach approach has once again been recognized by Indspire at their 2018 National Gathering for Indigenous Education. Tania Sterling, KPDSB Superintendent of Education, accepted the Indspire Nurturing Capacity: Documenting Community Success plaque on November 9, at the gathering in Edmonton, Alberta. The distinction was awarded to the KPDSB and Dryden High School’s Four Directions Graduation Coach approach for demonstrating a positive impact on the success of K-12 Indigenous students in the community. The recognition from Indspire was the result of a research paper by Sean Lessard, PhD, at the University of Alberta, looking into the impact of the Four Directions Graduation Coach approach in KPDSB schools. Four Directions provides intensive support to First Nation, Métis and Inuit students and their families with the goal of seeing each learner through to graduation. Four Directions staff assist with leading and implementing programs and connecting students and families to support services within the school and the greater community to increase each learners network of support throughout and beyond high school. Dryden High School was the first school within the KPDSB to implement Four Directions, celebrating a 41% increase to 80% of Indigenous students graduating in four years after four years of coaching. Indspire is a national Indigenous-led registered charity that invests in the education of Indigenous people for the long-term benefit of these individuals, their families and communities, and Canada. Their vision is to enrich Canada through Indigenous education and by inspiring achievement. In partnership with Indigenous, private and public sector stakeholders, Indspire educates, connects and invests in Indigenous people so they will achieve their highest potential. Trustees met at Dryden High School on Tuesday, November 13, 2018, for the final board meeting for the 2014-2018 Board of Trustees. 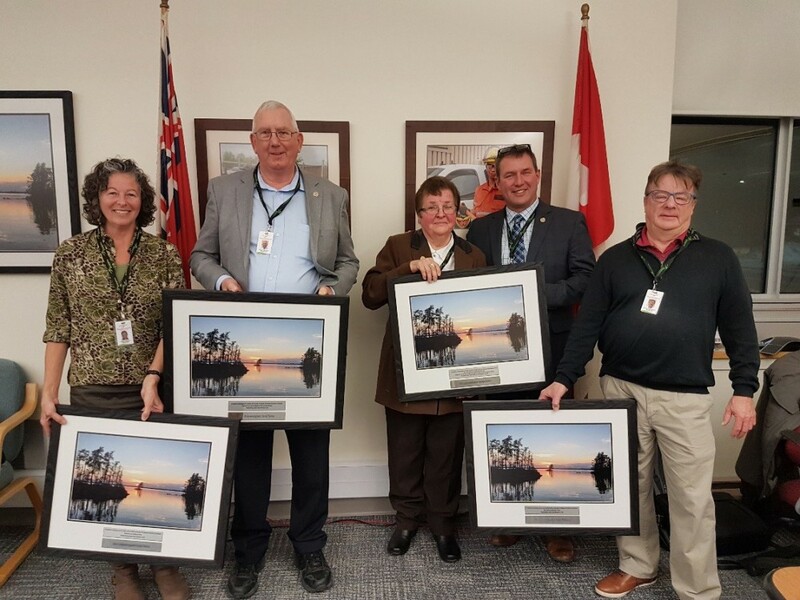 KPDSB staff and administration recognized the important contributions of several members of the 2014-2018 Board of Trustees who will not be returning to the Board for the 2018-2022 term. Board Chair Dave Penney was recognized following 33 years of service and dedication to students and staff in the Northwest. Trustee George Seaton was also recognized posthumously through the presentation of a gift on behalf of the Board of Trustees and staff to Phyllis Seaton (George’s wife) for George’s unwavering commitment to improving outcomes for youth for the past 40 years. Trustees Dave Wilkinson and Lesley Barnes were also recognized for their efforts and work with the Board. The November Kids Come First presentation titled ‘Connecting for Student Success – Open Roads Public School’ was received by Trustees. Principal Tanis Oberg and First Nation, Metis and Inuit (FNMI) Family Support Worker Adi Lang were accompanied by current and former Open Roads students and their families who shared their experiences at the school and the impact of the FNMI Family Support Worker position. The unique role of the Open Roads Family Support Worker is to make connections with students and their families so that they feel that they can be successful not only at school but within the community. The FNMI Family Support Worker is able to provide a wide variety of supports, depending on individual needs of families, including acting as a liaison between the family and the school by providing one point of contact, supporting regular attendance through constant open communication, connecting families with school/board and community services, and supporting families through any transitions they may be experiencing, whether that’s into or out of the school, or between classrooms/programs. Joan Kantola, Superintendent of Human Resources and Special Education, presented the 2018-2019 Special Education Plan. The plan guides the work of schools and the Board in terms of supporting and enhancing special education services. Areas of focus for the plan include providing programs and services in the student’s home school wherever possible (including appropriate accommodations and modifications), promoting a focus on inclusive practices in schools and respect for differences and diversity, providing a range of placement options for students, and collaboration with curriculum central support staff to ensure support for the development of quality programs and provision of services for all students. Kantola also shared that the Board’s Special Education Advisory Committee is looking for new members, interested individuals are encouraged to visit this link for more information. Richard Findlay, Superintendent of Business, presented the 2018-2019 Enrolment Report. Enrolment continues to show an upward trend overall in the KPDSB. Elementary schools reported an increase of 37 students in total from the 2017-2018 school year, with secondary schools reporting a decrease of 23 students Board-wide. A highlight in the enrolment picture was Beaver Brae Secondary School in Kenora with an increase of 30 students between the elementary and secondary panels, resulting in the addition of one full classroom and an additional teacher at the elementary level. Overall, the Board’s total enrolment for the 2018-2019 school year is 4,841 students (projections for the year were 4,827). Findlay also presented the 2018-2019 Capital Projects Report. Using School Condition Improvement funding, the KPDSB has 28 million in capital projects for this school year. As Sioux North High School in Sioux Lookout nears completion, the total renovation of Ear Falls Public School takes centre stage. At a cost of $5 million, construction at the school will see the total renovation of the building split into two phases. Phase 1 is set to begin in February 2019, with Phase 2 beginning in May 2019. The project is expected to be complete by September 2019. Also listed under Major Capital Projects is a renovation to Beaver Brae Secondary School’s technology wing. The total cost of the technology wing renovations will be $6 million and will upgrade the welding, transportation, Grade 7/8 technology, communications and hospitality rooms/spaces. Construction will begin in February 2019 with project completion anticipated for February 2020 (certain areas will be ready well before that date). To view the capital projects report, please visit this link. From left to right: Lesley Barnes, Dave Penney, Phyllis Seaton, Sean Monteith and Dave Wilkinson. WINNIPEG, MB: Windigo First Nations Council (WFNC) and the Keewatin-Patricia District School Board (KPDSB) are pleased to announce the signing of a Memorandum of Understanding (MOU) to enhance educational services and opportunities for students and staff. The agreement was signed today in Winnipeg, Manitoba during the WFNC Chiefs’ Meeting. The MOU is intended to establish a forum for the WFNC and KPDSB to work collaboratively to help design and promote strategies to equip First Nation students with the social, emotional and academic educational opportunities required to be successful in reaching their personal and educational goals, and in attaining achievement levels comparable to the general student population in Ontario. Student Support Services - Including student safety, social and emotional mental health, student transition and orientation programs, early exposure to career planning, parental empowerment initiatives, support mechanisms for students living away from home, student retention strategies, access and ongoing participation in extra-curricular activities, the development of a First Nation student anti-addiction education program, and other student support services as needed. Independent Education Plans (IEP) - Support in the form of strategies and professional mentorship will be provided to identify special needs students and to develop IEPs for such students. First Nation education will be supported with access to required student supports and programs, including access to professional development on all aspects of IEP evaluation and implementation. Curriculum - Development of curriculum modules and implementation strategies to enhance the inclusion and integration of First Nation history, culture, perspectives and language for all students in both First Nation and provincially operated schools. Professional Development - Strategies to reciprocate support of staff learning in meeting the holistic learning needs of First Nation students. Development of strategies to facilitate cross-cultural training and professional development for educators in the provincial education system. Communication - Identification of mechanisms to improve communication between provincially funded schools within the Ontario public education context, and First Nation schools. Human Resources - Activities to support the effectiveness of education and support staff in both the First Nation and provincially operated systems to help ensure that staff have the skills and training to meet the needs of First Nations in both education systems. Explore options to facilitate increasing the number of First Nation staff, including the participation of elders, in KPDSB schools. Develop and implement retention programs for administrators, teachers and support staff to improve staff relations and continuance of programming. Professional Mentoring - Engage in professional mentoring programs between First Nations and the KPDSB for best practices. Specialized Supports - Access to specialists, including but not limited to speech and language development, support staff, and literacy/numeracy specialists. Parental Participation - Strategies to facilitate improved First Nation parental communication, empowerment and involvement throughout their children’s academic years in all educational systems on and off their traditional territory. Frank McKay, WFNC Chief Executive Officer and Council Chair, stated “Today we are pleased to sign on behalf of the Windigo First Nations Communities and above all our students. We envision going forward with the issues outlined in the Memorandum of Understanding, it can only benefit our students, not only academically, but also emotionally and socially with the necessary supports that will ensure their success. We are pleased that we will be working in partnership with the Keewatin-Patricia District School Board to ensure the success of all WFNC students”. Photo caption (left to right): Henry Wall (Kenora District Services Board CAO), Frank McKay (WFNC Chief Executive Officer and Council Chair) and Sean Monteith, KPDSB Director of Education). Trustees of the Keewatin-Patricia District School Board met at Dryden High School on Tuesday, December 4, 2018, for the Inaugural Board Meeting. The Keewatin-Patricia District School Board swore in it’s new Board of Trustees, welcoming four new members for the 2018-2022 term. The list of Trustees and the areas they represent are below. The Board of Trustees elected Cecile Marcino from the Kenora area as Chair of the Board for a one-year term following 18 years serving as Vice-Chair. Trustees Dave Cornish, Barb Gauthier and Gerald Kleist all received nominations for the position of Vice-Chair with Trustee Gerald Kleist ultimately being elected as Vice-Chair for a one-year term. Kleist has served as a Trustee for the Ear Falls area for 18 years. Trustee Barb Gauthier was appointed to the Executive Committee for the period of December 4, 2018, to April 12, 2019, and Trustee Bob O’Donohue was appointed to the Executive Committee for the period of April 22, 2019, to November 30, 2019. Trustees Roger Griffiths, Marilyn Duncalfe and Michelle Guitard were appointed to the Audit and Finance Committees for a one-year term. Trustees Eric Bortlis, Dave Cornish and Gerald Kleist were appointed to the Indigenous Education Advisory Committee (IEAC) for a one-year term. Trustees Eric Bortlis, Dave Cornish and Darrin Head were appointed to the Special Education Advisory Committee (SEAC) for a one-year term. Trustees Barb Gauthier and Marilyn Duncalfe were appointed to the Early Years Advisory Committee (EYAC) for a one-year term. Trustees Darrin Head and Michelle Guitard were appointed to the Parent Involvement Committee (PIC) for a one-year term. Trustee Jennifer Kitowski was appointed to the Transportation Policy Committee for a one-year term. Trustee Jennifer Kitowski was appointed to the Ontario Public School Boards’ Association (OPSBA) Board of Directors. The Keewatin-Patricia District School Board has become the first school board in Ontario to register all its schools for the OPHEA Healthy Schools Certification. OPHEA’s Healthy Schools Certification recognizes and celebrates school communities for promoting and enhancing the health and well-being of students, school staff, and the broader community. Participating schools across Ontario complete the 6-Step Healthy Schools Process, which aligns with the Ministry of Education’s Foundations for a Healthy School resource. Through a point-based system schools plan their Healthy Schools process over the course of the school year. They outline the steps needed to achieve certification as gold, silver, or bronze. OPHEA is a charitable organization that champions healthy, active living in schools and communities through quality programs and services, partnerships and advocacy, and is led by the vision that all children and youth value and enjoy the lifelong benefits of healthy, active living. In the 2017-2018 school year, 16 KPSDB schools received the OPHEA Healthy Schools Certification with 11 achieving gold level certification.